Looking for a place to deposit your old or unused electronics?? This year we will be providing a depository bin at the hamfest for you to drop off old and unwanted items that you would like to get rid of but haven’t had the ability to trash. Thank you for your interest in attending this years Atlanta Hamfest! With only hours to go, table assignments require a little more one on one. Everyone loves a good Tailgate! The Atlanta Hamfest offers a great tailgating experience. Plenty of space is available, you’re not stuffed into one parking space, bring your tables and spread out! Taligating is a “first-come, first served” event. Gates open at 6AM for set-up. Advanced registration is not necessary or even available. Your ticket to tailgate is just $10. Last edited by KJ4ZDD on Wed Jun 01, 2016 8:53 pm, edited 1 time in total. Yeah, we talked about this at the Skype meeting. We would have loved to table, but we remembered too late to do paperwork and such. I have the weekend off, so I might just attend anyway. Yeah, sorry I ended up missing that meeting, turns out I got free and turned on Skype about an hour after it ended. Would the following email exchange serve as proper approval from HQ regarding the event, this close to the last minute? KJ4ZDD wrote: May 29, 12:07PM, to chapters@zombiehunters.org"
Just following up with my previous request for a banner, from Feb. 16th, as the intended event is now 5 days away. The print shop does offer overnight turnaround. I'm hoping to have things ready by June 4th, for the Atlanta Hamfest, where ZSC-016 can showcase the importance of personal radio communications if/when all other methods fail. Send is pictures of the banner in action! Also, I've submitted the vector graphics file to the print shop, by tomorrow they should have a shiny new poster with the ZSRC logo, ready to go. I've left a voicemail and sent an email to the organizer of the Hamfest, to go through whichever hoops they need me to do to have a table. Alright, John N3ACK responded, with good news: because we are a club, we get a table for free! 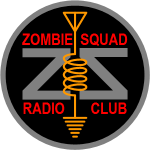 We have the Zombie Squad Radio Club banner! The files have been archived with HQ, should any other ZSRC groups wish to make anything with the logo (thanks go to Davo, Purple_Mutant, and Kyle). There is an early setup option, starting at noon on Friday. I'll use that to set up leisurely, and not be rushing at 6am on Saturday to have everything ready. Well, that was fast. I'll be leaving for work in a couple minutes, so I probably won't be able to help with set up today, but there's a good chance I can table tomorrow. Like the last few HAM events we've done, I still don't have my license or have a vast knowledge of the field, so I'll just be hanging out and chatting with people about ZS. I'll text Slugg and see if I can't get him to show up as well. How did set up go? Work got in the way earlier, then I was informed I have Symphony tickets for tonight. So, no early setup. 6AM and caffeine for me tomorrow morning. I see. I'll be there in the morning. Kate has work. Hamfest was a lot of fun. KJ4ZDD and I were in attendance. Talked to a lot of people. Added some names to our email list. Handed out about 15-20 tech license study guides. Made some good contacts. Got to test out our new Zombie Squad Radio Club banner! (Shoutout to KJ4ZDD for making that happen). We are always well received at ham radio events, by those attending, staff and other tables/vendors. We were also invited back to the Stone Mountain Hamfest this October (same one we tabled at last October), so that'll be fun. For those of you who don't have your tech license, but are interested, I plan to take the test at the October Hamfest, so y'all can join me. Good luck A Zombie on your exam! Thank you guys for throwing up a table there on short notice. It sounds like you guys did a great job. Just a note on the Stone Mountain Hamfest, it's held on November 5-6th, the one in October is the Chattanooga Hamfest, held on October 22.